Mother Nature—or as I like to call her—a farmers curve ball. You never know what she will throw at you. However, you can bet without doubt she’s going to one way or another. In her most recent pitches she’s thrown out hurricane Harvey and the wildfires in Montana. Tonight, the sun was masked with what I assumed to be smoke from those fires in Montana. She has made her presence known with the two catastrophic events and she’s getting ready to throw her third strike with hurricane Irma. Lately, my husband and I have been really stressing about the crop prices, equipment breakdowns, and the mounds of bills piling up. But you see, today when I saw that haze it stopped me in my tracks while washing dishes looking out the kitchen window. Here I was worrying over these easier yet still troubling pitches that are being thrown at us–when there are farmers and ranchers who have lost everything. I mean everything–their homes–their animals and crops and their livelihoods. Some were able to save some things while others struck completely out. What this has brought into play is the true American. The land of the free and the home of the brave has shined through. This is the America and Americans Thomas Jefferson and George Washington would be proud of. The Americans facing tragedy as one united and helping one another in the face of hardship. 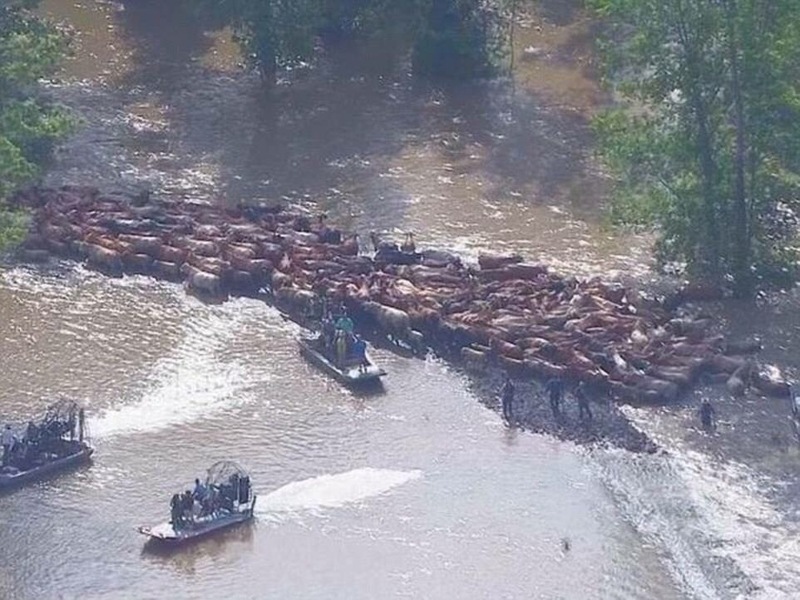 The pictures of ranchers herding not only their livestock but others through the flood waters is heart wrenching. The picture of firefighters, families and animals with the fire in the horizon is breathtaking and not in a good way. Reports of over 600,000 acres have burned in Montana–with the fires still out of control. Farmers losing their massive cotton crops and their hay supply for the winter. Those games are still in play but with fellow ranchers and farmers around to help–those losing the game now can make a comeback in the next few innings (days and months) ahead. As farmers and ranchers we continue to play the game, we don’t quit. We might not win the World Series every year or we may come in dead last–but at the end of the day we hold our heads high–help our teammates and continue playing the game we love so much –FEEDING THE WORLD. In the days, months and years to come I will no longer drown myself with my losing streak. Instead I will take a step back and cheer and support my fellow teammates (my fellow ranchers and farmers) on their uphill battle with their fight against team Mother Nature. She may win the fight–the game–this time–but the games in the days to come she better come prepared because Team “farmers and ranchers” have many years of practice with slumps. However, we always manage to come back to fight our way through the next season. So reach out and support our fellow teammates. Give them the resources you have available and most of all share your faith and confidence that they will pull through to make a comeback. Our team is forever united as one. We have FAITH, we have FRIENDS, we are FAMILY. We are feeding the world one game at a time.